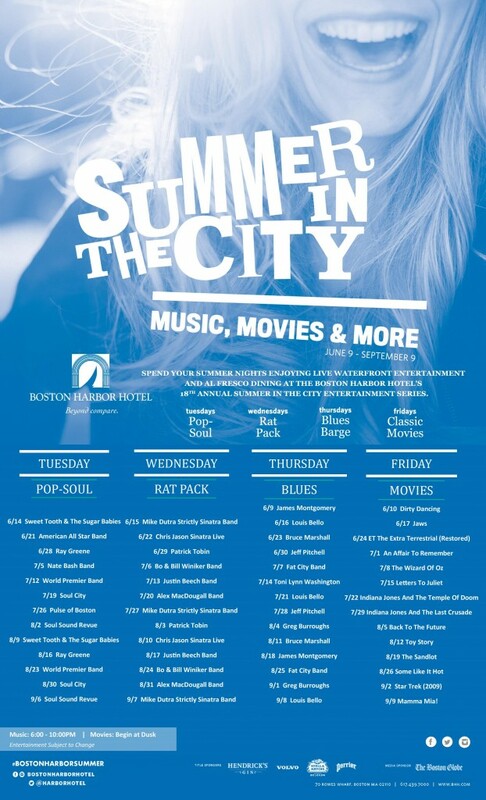 Entertainment Specialists is proud to announce the “Summer in the City” entertainment series is back this season with evenings of live music at the Boston Harbor Hotel. Starting on June 14 and ending in early September, there will be a full line up of entertainment on the waterfront. Tuesday nights will host suchbands as Sweet Tooth & The Sugar Babies, Ray Greene & Innervisions, World Premier Band, Pulse of Boston, Soul City and Soul Sound Revue. Thursdays are focused on Blues and will feature James Montgomery, Louis Bello, Bruce Marshall, Jeff Pitchell, Fat City Band, Toni Lynn Washington and Greg Burroughs. We are proud to be a part of this one of a kind event in Boston!